So you've seen my whole outfit before, but it was bound to happen at some point, right? Anyway, I have no issues with repeat outfits. It's fun seeing how many different ways you can wear something, and if it looks good, why not wear it All The Time. 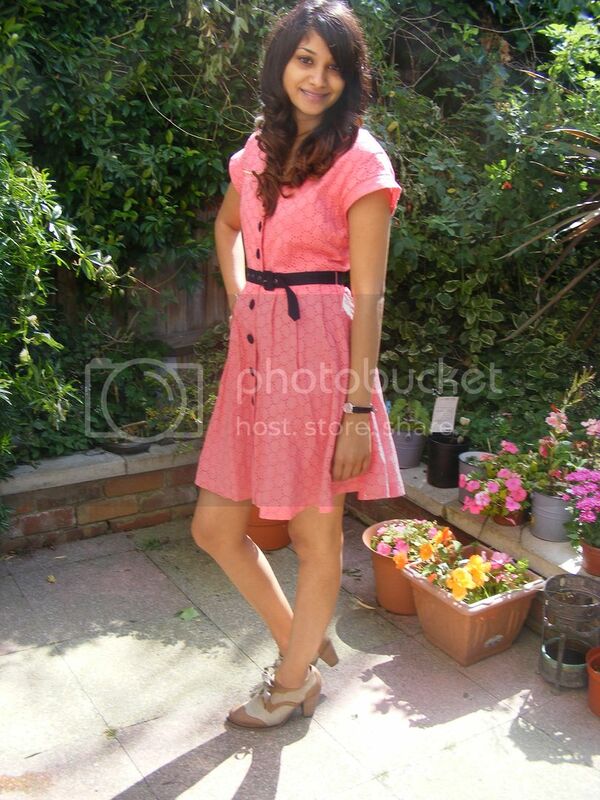 I'm wearing my favourite pink Henry Holland for Debenhams dress and my gorgeous Sarenza shoes. I've worn them separately a lot, but together, the two look really good. And the picture below was taken by Susie! I'm so glad that she's back in town. I missed my favourite photographer (and she's great fun too)! And I think you can just about see my bangle in the picture below. It's gorgeous and was a present from Susie and Milana :) Thanks guys, I love it! How do you feel about repeat outfits? Is there any outfit you constantly wear? I repeat outfits ALL the time but I try and style them differently if I am photographing them :)I love this dress though, absolutely gorgeous!! I like repeating outfits - if I know that something fits me really well, why not to wear it again? Why wouldn't you want to wear something All the Time if you liked it?! Hehe, so happy to be back and love this dress on you! See you manana! Sherin, I can't even get over how gorgeous you are, my dear friend! That dress fits you perfectly and looks amazing. I adore your dress. I would happily live it. Its good to repeat outfits, it shows they were a success. I am always repeating what I wear. Love this dress, I love all your dresses to be fair ha! Love this dress. What a gorgeous color!!! I looove your dress! I definitely love to repeat outfits. Why mess with a good thing? Plus sometimes I'm just lazy haha! I wear things half to death! I even wear items over again, not just combos! I was looking at my Lookbook page the other day, and every single item (sans a few accessories) in every single look has featured in at least one other look as well! lovely summer dress. love the colour and the shoes you paired it with. Oh my god. There are so many things I wear over and over again. Right now I've been reusing a sheer Topshop shirt with gold buttons. It's like it just goes with everything I own!! Would love if you could check out the latest style icon post from Goldie London. This week we've chosen Jean Shrimpton. What do you think of her. Are you a fan? awww u look gorgeous - the dress is adorable and your hair looks amazing! I say if you love it, wear it! That color looks so nice on you ! cute dress! cute color... I don't care about repeating outfits... we don't have celebrities closets soo we have to be creative with what we have!!! I have about a million outfits I always re-use, I have to try and remember what I've worn and with who. It just makes you want to buy more clothes in the end! I love remixing and I love your dress! Yes to remxing. I think it shows the creativity of the wearer. Besides this dress deserves to be worn and photographed many times! This dress looks amazing on you! That pink shade is really stunning! Love those shoes too! pretty dress and your hair is perfect. That dress is awesome! I agree it's fun to see different ways to wear one look. It also makes you human. I don't get these bloggers who never wear the same thing again. How big are their closets? !